London designers JamesPlumb have installed an antique church pew to create an aged interior for outfitter Hostem's new shop in Shoreditch, London. The floorboards are restored but unfinished, while dusty hessian panels and linen curtains decorate the walls. The chandelier was made from reclaimed lampshades and door handles from curtain rails. Clothes are hung on cold-bent metal clothing rails, and individual items highlighted by ceiling-hung light bulbs. From the warm tones of the washed out Swedish linen curtains and biscuit restored floorboards - to the raw, exposed bulbs that glow softly on the discreetly luxurious hand-painted hessian wall panels, a sense of quiet and calm pervades. This is Hostem, in the heart of Shoreditch’s thriving Redchurch Street, a new menswear establishment where the avant-garde and the street coalesce and where the traffic and shrill, city noises fade to mute. A menswear establishment intent on mixing luxury street brands with conceptual, left-field labels in an environment of considered, understated elegance. In creating a home for his venture, founder James Brown knew that nothing short of unique would suffice. In housing labels such as Ann Demeulemeester, Visvim, Rick Owens and Casely-Hayford, Brown needed something enticing for the former industrial space Hostem takes over. To this end, he looked to the work of interior design duo JAMESPLUMB, founded by Hannah Plumb and James Russell. Using restored materials and re-working pieces from the past to imbue the present with history and timelessness, the interior designers debuted at this year’s Salone Internazionale Del Mobile in Milan and are currently enjoying a rapidly rising profile thanks to recent features in 'How To Spend It' and 'The World of Interiors'. 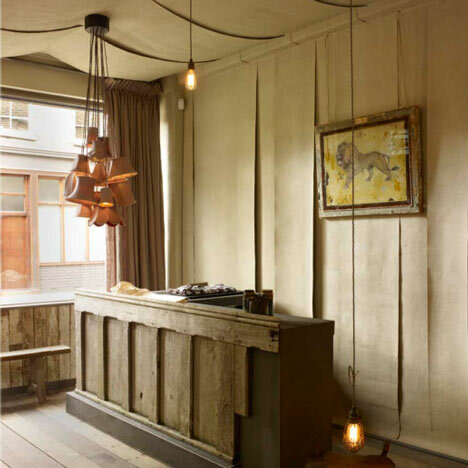 Upon meeting the designers and seeing their home and studio (a cottage in Stockwell Green that houses a veritable treasure trove of delightful curiosities, amongst them a lamp that began life as an antique roller skate and 19th century bird cages) Brown knew that Hostem's interior concept lay in their hands. The two met at Wimbledon School of Art, where they studied fine-art sculpture. Their aesthetic is based on a deference to history through the re-working of antique and reclaimed pieces, which sees lamps, bulbs and screens re-interpreted and re-born as individual articles. As the first commercial project for JAMESPLUMB, the designers were aware that Brown had bestowed huge trust upon them. 'We'd just started the job and arrived carrying a church pew covered in rotten leaves,' says Hannah. 'It raised a few eyebrows, I can tell you'. The pew now stands centrepiece as a beautifully bespoke front desk. Gleaning gems from life’s detritus; pieces can be salvaged from the side of the road, a skip, or found at car-boot sales and furniture reclaim yards. The store’s three finished rooms, including an ever-evolving space housing different designers, carry this love-worn JAMESPLUMB perspective. Floorboards are aged with stories of comings and goings of old. Crackled artworks by Huw Griffiths adorns the walls. Vintage lampshades are wittily reworked into a chandelier that bustles like some sort of bouquet as seen by Dali. Rick Owens trainers sit atop one of the many cement plinths, filled railway conductor bags double as mini sculptures, all in all the perfect marriage of modernity and heritage. Vintage US Trouble Lighting hangs from long cables, allowing customers to manoeuvre the glow for closer examination of the clothes. "Down to the last door handle whose previous life was a curtain pole finial, we wanted Hostem to have depth and detail", says James Russell. The Plumbs work alone in perfect design unison, down to the hanging of wall canvases - painted hessian that has been given a secret treatment (and no, they’re not telling) to achieve the final rustic, dusty look. They did however enlist master metal worker and designer Alex Pole to cold-bend the imposing clothing rails by hand-working metal over a cog he found in a Somerset river; and Beata Barton Chapelle to make the stores thick, luxurious linen curtains. The overall effect is one of calm assurance. Of quality, of personality, of history, wit and considered, intelligent design. Much like the clothes within.